KRAFT has partnered with Rancho Obi-Wan, Guinness Record holder for the largest private Star Wars collection, to curate largest Star Wars memorabilia collection ever seen on a TV commercial. The ad hits on the nostalgia a dad feels for the franchise, hitting on the lengths some collectors go to keep their collections in good condition. Now, for the first time, fans can visit KraftStarWarsRoom.com learn about the collection of iconic memorabilia, including Star Wars KRAFT Mac & Cheese. The site gives fans a new way to feed their inner Jedi with exclusive access to limited-edition collectibles housed in one amazing shrine. 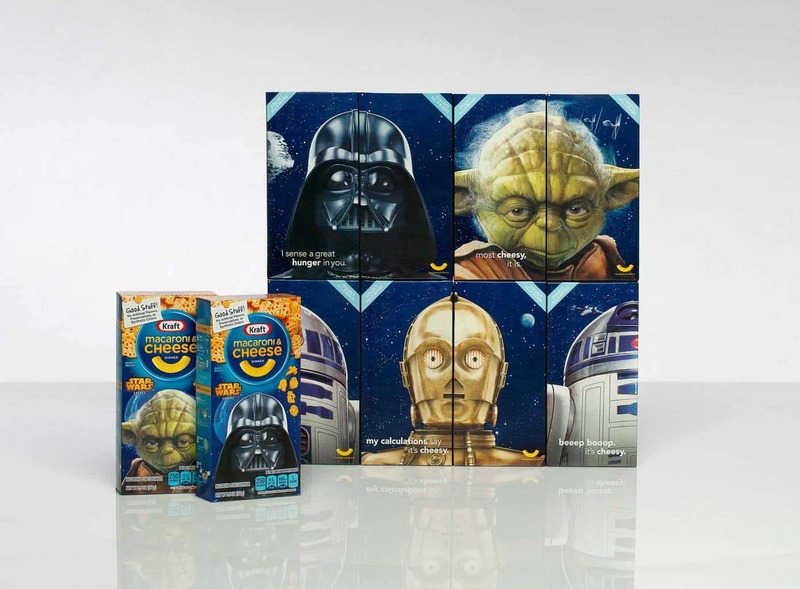 Collector’s edition Star Wars KRAFT Mac & Cheese is on shelves now in four collectible character boxes, featuring left and right faces of Yoda, Darth Vader, R2D2 and C3PO. Select retail stores will also offer limited-edition collector’s posters with purchase, depicting iconic movie scenes featuring Star Wars KRAFT Macaroni and Cheese noodle characters.